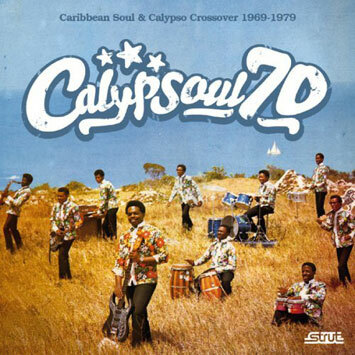 Strut turns its magnifying glass onto the Caribbean for Calypsoul 70, a celebration of the magnificent array of crossover calypso, reggae, latin, Afro and soul styles that emerged, often from small studio and label stables, during the '70s. Taking the listener on a non-stop island-hop, the album digs deep into Trinidad's steel pan and marching band archives with a terrific cover of Gwen McCrae's '90% Of Me Is You' alongside tough social commentary from Martinique legend Marius Cultier and Cuban salsa heroes Los Van Van and touches on island links with Africa courtesy of Wadadi Experience (Antigua) and an Afrobeat-inspired plea for freedom from legendary calypsonian, Duke. And, to finish, it adds in a strong helping of fascinating soul and disco fusions from short-lived island bands like Magic Circle Express (St Lucia), The Checkmates (Barbados) and Ophelia (Dominica). As well as a valuable selection for diggers, the album is designed as an ultra-handy package for DJs with a host of playable tracks and rare cover versions. All in all, the perfect funky tropical Summer soundtrack for the beach, club or BBQ. Calypsoul 70 features extensive sleeve notes and artist interviews by leading music historian Francis Gooding, alongside rare photos and album sleeves. Compilation by Duncan Brooker, the man behind Stut's 'Nigeria 70' selections. Effectivement cette compilation a l'air très appropriée pour les barbecues et les tropical parties ...de l'été prochain!! enfin bref. Ou est-ce qu'on peut éouter?Tu sais quand ça va sortir en vinyl? je présente cette compilation surprenante sur Neo-Geo avec Bintou ! !